NETWORK FINALS: There were no changes from the preliminary Saturday ratings. CABLE HIGHLIGHTS: HBO’s TOUR DE PHARMACY special crossed the finish line at 0.15, sharply down from the 0.29 for Andy Samberg’s 7 DAYS IN HELL special in 2015. A&E’s LIVE PD was on top of Saturday cable, returning from a holiday week off at a steady 0.57. NBC Sports Net’s NASCAR race was at 0.48. 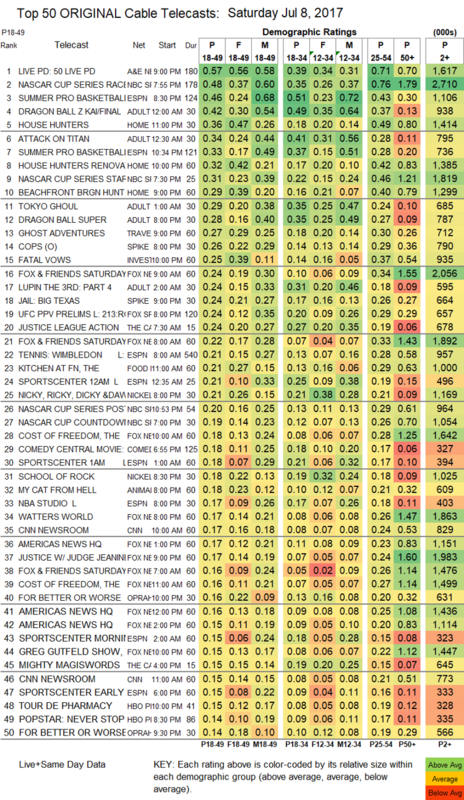 ESPN continued its SUMMER NBA coverage with games at 0.46/0.33. Adult Swim’s late-night line-up returned from holiday hiatus as follows: DRAGON BALL Z down 0.08 to 0.42 (the primetime episode was down 0.03 to 0.28), ATTACK ON TITAN down 0.08 to 0.34, TOKYO GHOUL down 0.09 to 0.29, LUPIN THE 3RD down 0.02 to 0.24, HUNTER X HUNTER down 0.03 to 0.27/653K, NARUTO down 0.02 to 0.23/568K, and GHOST IN THE SHELL down 0.05 to 0.20/521K. HGTV’s Saturday line-up had HOUSE HUNTERS up 0.04 to 0.36, and HOUSE HUNTERS RENOVATIONS up 0.04 to 0.32, with BEACHFRONT BARGAIN HUNTERS up 0.04 to 0.29. Travel Channel’s GHOST ADVENTURES climbed 0.09 to 0.27. On Spike, COPS was at 0.26, compared to 0.24/0.22 2 weeks ago, and JAIL: BIG TEXAS was at 0.24. ID’s FATAL VOWS rose 0.06 from last week to 0.25. On Food Network, KITCHEN AT FN dropped 0.04 from last week to 0.21. OWN’s FOR BETTER OR WORSE was at 0.15/0.14/0.11, compared to last week’s 0.15/0.13/0.11. AMC’s TURN fell 0.05 from last week to 0.10. BBCAmerica’s ORPHAN BLACK ticked down to 0.07.